November | 2011 | Things That Go [BLEEP]! Play the Limited Collector’s Edition Bonus Disc. Continuously use Xbox Live Labs for 30 minutes. R.A. Salvatore, Tood McFarlane, and Ken Rolston. If you have any knowledge of video games, fantasy, or entertainment you should know what it means to have all three of these amazingly talented people on the same game. Enter: Kingdoms Of Amalur: Reckoning. The more I hear about this game, the more I want it. People are calling this game “an Elder Scrolls Killer”. While I won’t go that far, I will say that it looks like this game is going to give the beloved Lionhead Studios franchise, Fable, a run for its’ money. I don’t know where people are getting Elder Scrolls from because by all the videos I’ve seen, this game is more closely resembled to Fable. With that being said, I have no doubt that the storyline of this game will be anything other than fantastic. When it comes to modern fantasy authors, there are none better than R. A. Salvatore. If you do not know who that is, all you need to do is google: Drizzt Do’Urden. That is all you need to know! As for Todd McFarlane, creator of the comic book character Spawn, you can definately tell that a great amount of detail has gone into his creatures models in this game. I expect nothing less that to be amazed by his wicked imagination. Lastly, we have Ken Rolston. Lead designer for both TES III: Morrowind and TES IV: Oblivion. Not much more needs to be said about this guy either. I’ve seen many great game ideas go horribly wrong, but this game….this is going to be one to watch out for. So watch the video and tell me what you think in the comments below! For a look at the pre-order bonuses click this link. 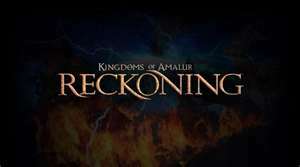 Kingdoms of Amalur: Reckoning will be released in North America on February 7th, 2012 and in Europe on February 10th. Complete a tournament game of Full House Poker. Win two consecutive hands in the showdown.